The discovery of antibiotics is one of the greatest, if not the greatest, achievement in medical history. A small pill can cure formerly incurable vicious diseases including the bubonic plague, cholera, typhus, etc. - what more could one expect from a medical breakthrough? Success on another medical front remains limited. Despite significant therapeutic improvements as a result of advanced surgical strategies, radiotherapy, chemotherapy, and oncogenic pathway inhibition, cancer remains an undefeated enemy in medicine. A small pill that can cure cancer has so far remained elusive for most types of tumor. 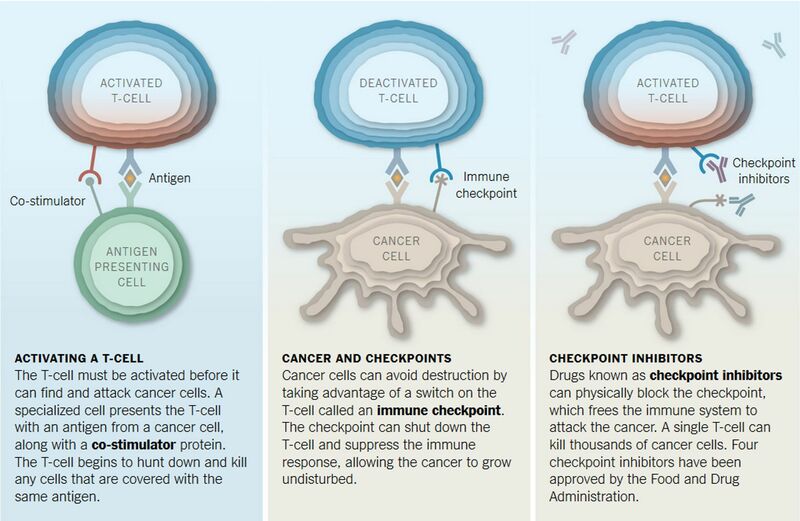 A fifth pillar of cancer therapy has, however, recently come of age: cancer immunotherapy. This novel therapeutic paradigm attempts to harness the power of the immune system and boost its efficacy in fighting cancer. One approach is to lift the repression of the immune system exerted by tumor cells in order to prevent their detection and liquidation. This strategy is called immune checkpoint blockade or checkpoint inhibition because it targets the molecular inhibitory checkpoints that restrict the immune system’s activity. 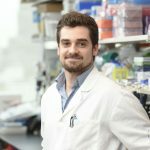 Luis Felipe Campesato explains how this can be done and describes the striking clinical results achieved in some patients affected by advanced-stage tumors, in particular melanoma, that would otherwise have been fatal. The cure is within us. A sentence that seems like a cliché from a self-help book is gradually proving to be true. Our immune system - comprised of a network of cells, tissues and secreted factors – is responsible for protecting our body against a wide range of potentially harmful stimuli, like viruses, bacteria and other invaders. Immune cells such as lymphocytes actively patrol our body looking for these invaders, eliminating them once they are recognized. Lymphocytes consist of two cell types named B and T cells. B cells are known for their ability to produce antibodies while T cells can directly or indirectly eliminate foreign invaders. T cells are particularly known to be powerful killers and strategies to empower those cells and promote immunity have been the subject of strong interest in the scientific community for a long time. The discovery of the benefits of vaccination – considered one of the greatest public health achievements of the 20th century – is a good example of how stimulation of individual immunity dramatically changed the course of several infectious diseases and saved millions of lives worldwide. The idea that our immune system could not only scan the body for microbial pathogens but also for malignantly transformed cells was conceived more than 100 years ago by the German physician-scientist and Nobel prize winner Paul Ehrlich. Ehrlich speculated that tumor cells would have to differ from their normal counterparts – thanks to intrinsic features like accumulated mutations and altered patterns of gene expression that we now are aware of – and that could make them susceptible to immune recognition. In the 1890s, the New York surgeon William B. Coley had observed that tumors shrank in some cancer patients with incident bacterial infections, and many of them appeared completely cured of the disease. Surprised by that, he decided to try injecting a mix of bacterial toxins in one of his cancer patients with advanced stage disease, who subsequently developed a remarkably good response. This experiment began Coley's lifelong study of immunotherapy. For the next 40 years, he treated hundreds of patients with inoperable tumors using his mix of bacterial toxins with some degree of success. Because of his achievements, Coley is now considered the "father of cancer immunotherapy", a field that has been growing astonishingly fast in the last few years. 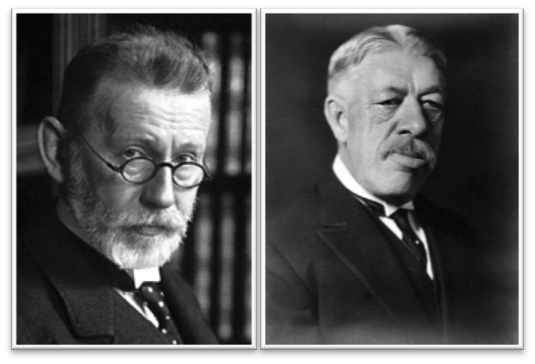 Paul Ehrlich (left), a German-born and Nobel Prize winner (1908) in Physiology or Medicine for his contributions to immunology, and William Bradley Coley (right), an American-born surgeon and cancer researcher, are pioneers in the field of cancer immunotherapy. (Image credits: nobelprize.org [left] and Wellcome Images [right]). Researchers are currently focusing on two promising types of immunotherapy. One creates an individualized treatment for each patient by collecting some of the person’s immune cells, altering them genetically so they are trained to recognize proteins expressed by cancer cells and then infusing them back into the bloodstream. This approach is called adoptive cell therapy and has produced long remissions in a few hundred children and adults with deadly forms of leukemia or lymphoma for whom standard treatments had failed. The second approach, far more widely used and responsible for most of the current success of immunotherapy in cancer treatment is based on the use of antibodies targeting proteins that act as critical inhibitory checkpoints on T cells, such as cytotoxic T-lymphocyte protein 4 (CTLA-4) and the programmed cell-death protein 1 (PD-1) and its ligand (PD-L1). 3) side-effects exist, but are much milder in comparison with other therapies and can be readily controlled by treatment using steroids, allowing patients to lead relatively normal lives. This animation illustrates how tumour cells are sensed and destroyed by cells of the immune system and how tumours can evolve to evade immune-mediated elimination. Scientists are developing new immunotherapies that help the immune system to "fight back" (Video credit: Nature Reviews Cancer and Nature Reviews Immunology). However, it is not all a bed of roses. ICB therapy is so far only approved for diseases in advanced stages and, except for metastatic melanoma, not as a first-line treatment option. Importantly, these therapies seem to generally benefit a minority of patients. Understanding what makes those patients respond and why others do not is the subject of intense scientific research and this knowledge may help us to significantly expand the number of people who can benefit from this promising therapeutic approach. In order to contemplate the challenges currently faced by the scientific community in the field of immunotherapy, it is important for the reader to have a better picture of the biology behind ICB therapy. Human beings have developed an intricate system that prevents T cells from becoming over-stimulated. There is a regulated balance between stimulatory and inhibitory signals that are crucial for the maintenance of self-tolerance (that is, the prevention of autoimmunity) and also to protect tissues from damage when the immune system is responding to pathogenic infection. A T cell is initially activated through the interaction of its T-cell receptor (TCR　) and a cognate antigen　presented on the surface of an antigen-presenting cell (APC　). This initiating event is called Signal 1. However, this interaction is not enough to trigger effective T-cell activation. For that, an additional signal is required (Signal 2, called co-stimulation) which consists of the interaction between a surface protein expressed by T cells (for example, CD28) binding co-stimulatory molecules present in these APCs, such as CD80 or CD86, which then license T cells to kill any cells expressing that antigen. In the absence of co-stimulation, T cells that recognize antigen will either fail to respond and die or enter a state of unresponsiveness known as anergy. Inhibitory checkpoint proteins like CTLA-4 become expressed by activated T-cells and can bind co-stimulatory molecules such as CD80 with higher affinity than CD28 (Signal 2), thereby limiting T-cell stimulation. CTLA-4 thus has a central role in suppressing T-cell function, thereby restricting T cell-mediated antitumor activity. Notably, CTLA-4 is a protein highly expressed by a subset of T cells that play an important suppressive function (T-regulatory cells). Aside from disrupting CTLA-4 ligation with co-stimulatory molecules, anti-CTLA4 therapy has been shown to deplete this population of T-regulatory cells. Not surprisingly, CTLA-4 blockade has paved the way forward for modern cancer immunotherapy. Results from a phase III clinical trial published in 2010 showed a significant improvement in the overall survival of patients treated with ipilimumab (an antagonist anti-CTLA-4 human antibody that blocks the inhibitory effects of CTLA-4) . This result was a breakthrough in the medical community not only because for more than 20 years no other treatment had previously been shown to improve the average survival of melanoma patients with the disease in advanced stages, but also because it was a proof that targeting inhibitory checkpoints of the immune system could potentially fight cancer in a very efficient way. Since then, ipilimumab has been approved by the FDA for the treatment of melanoma and has produced dramatic responses in a subset of patients. Other important targets for ICB therapy are PD-1 and its ligand PD-L1. Drugs that target this axis are currently among the most promising agents in clinical oncology. Two anti-PD-1 drugs, pembrolizumab and nivolumab, were approved by the FDA in 2014 after the publication of data from clinical trials showing that up to 40% of patients with advanced-stage melanoma, including those who previously had no response to ipilimumab (anti-CTLA4), experienced objective responses . Like CTLA-4, PD-1 is an inhibitory receptor expressed on T cells. However, whereas CTLA-4 interferes with co-stimulation (Signal 2), PD-1 limits the activation of T-cell responses by inhibiting TCR signaling (Signal 1) on engagement of its ligands PD-L1 and PD-L2. PD-L1 is broadly expressed on the surface of other immune cells and other cells throughout the body while PD-L2 has a more restricted expression pattern (APCs have been shown to inducibly express PD-L2). PD-L1 expression is thought to be important in dampening T cell activation to prevent autoimmune or bystander damage in tissues. In addition, tumor cells are known to express PD-L1 as an acquired mechanism of evading elimination by the immune system. Recently the first PD-L1 blocking antibody, atezolizumab, was approved by the FDA for treatment of patients with locally advanced or metastatic bladder cancer, expanding the repertoire of drugs that target the PD-1/PD-L1 inhibitory axis. As mentioned previously, the identification of predictors of response is critical to identify patients that can potentially benefit from ICB therapy. The expression of PD-L1 on tumors for example has been thought to be a good predictor of a patient’s response to anti-PD-1 based therapies. Although emerging data suggest that overexpression of PD-L1 on tumors is associated with improved clinical outcomes with anti-PD-1 therapy, the presence of robust responses in some patients with low expression levels complicates the issue of PD-L1 as a predictive biomarker. In addition, genomic features such as number of mutations in tumor cells have been recently linked with durable immunotherapy response. The equation is simple: the higher the number of DNA mutations, the more likely an immunogenic　mutated protein (also known as a neoantigen) will be expressed which in turn will then facilitate a more robust immune response against cancer cells. This association helps to explain why cancers with defects in DNA-repair mechanisms, as in cases of microsatellite unstable colorectal cancer, seem to respond particularly well to immunotherapy. Even though this strategy seems useful for separating responders from non-responders, there are still many patients with a low mutational burden that respond to ICB (and vice versa). Other approaches such as looking at the immune cell composition in the tumor microenvironment and the presence of specific gut-resident bacteria are under active investigation for their use as reliable biomarkers. Therefore, the search for stronger predictors of response persists and is critical to stratify patients for this costly therapy in the face of multiple emerging treatment options for metastatic cancer. The remarkable clinical success of cancer immunotherapy has generated considerable excitement and boosted significant investment in the field. A lot of effort is currently being put into identifying new therapy targets and to decipher the mechanisms of action of immunotherapy drugs, with the goal of identifying new inhibitory mechanisms that could be targeted to achieve responses in patients with refractory cancers. Besides ICB and adoptive cell therapy, a number of other immunotherapy approaches also offer great hope, including immunomodulatory small molecules, T cell co-stimulatory molecules, oncolytic viruses, vaccines and tumor targeting antibodies. Importantly, harnessing the power of the immune system in poorly inflamed tumors where there is a lack of infiltrated T cells represents one of the biggest challenges for the cancer immunology community. Nevertheless, there are great optimism that in the near future a combination of immunotherapies with other conventional therapies, such as chemo- and radiotherapy – or other mechanisms that are able to drive immune cell infiltration into the tumor – will enable the design of optimal cancer therapies tailored to treat each particular cancer; and with the ongoing progress in precision medicine, to facilitate personalized therapeutic selection for each patient. Murphy KM and Weaver C (2016) Janeway's Immunobiology W.W. Norton & Company, Inc.
Luis Felipe Campesato is a Research Fellow at the Memorial Sloan Kettering Cancer Center, New York. He works in the Jedd D. Wolchok laboratory, which carries out pioneering work on cancer immunotherapy.